Deaf children may soon hear more clearly, thanks to a Melbourne trial starting in March. Using a non-invasive technique, Professor Colette McKay and her team at Melbourne’s Bionics Institute will image the “hearing brain” of children – data which could help clinicians tune hearing devices for infants and newborns for a sense of hearing much closer to the real thing. Around one in three children with a cochlear implant poorly understands speech and develops their spoken language much later than other children. While hearing problems can be detected early in infants, the problem is hearing devices are tuned as one-size-fits-all – and the device settings which work for one child may not work for another. But in Melbourne – the birthplace of the cochlear implant – McKay is spearheading research which could change the outlook for hearing-impaired children. 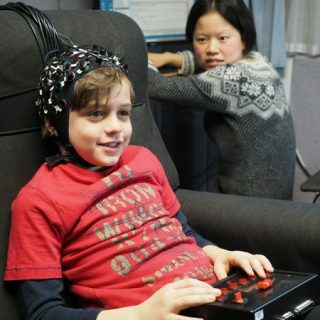 As the subjects are exposed to different speech stimuli, McKay’s team can visualise which areas of the brain become activated by tracking which regions contain more oxygen. In previous studies on adults, McKay discovered these brain signatures correspond to recognition of language. Now, McKay’s group is working in partnership with the Taralye oral language centre for deaf children to trial and develop the technology for children, which she hopes will one day allow clinicians to tune hearing devices specifically to every child. Next month, McKay will begin trialling her fNIRS technique on hearing impaired children as young as 18 months and she is currently raising money for sensors that will allow her to extend the trial to newborns. Virginia Olivares, a senior audiologist from Chile’s Universidad de Valparaíso who has experience with monitoring hearing in children, has just arrived in Melbourne to assist with the trial. McKay not only hopes to better tune programs for cochlear implants in children, but also to discover the signatures for normal speech development – which could allow for early intervention and personalised treatments. To that end, she is currently in conversation with Dr Angela Morgan at the Murdoch Childrens Research Institute to develop collaborations to investigate whether her fNIRS technique can provide useful clues to direct treatments for children with language disorders. 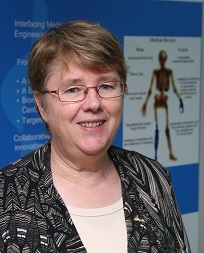 McKay is encouraging other research teams to approach her regarding new collaborative projects. “We have a new method for observing the brain that is uniquely patient and child-friendly – it has wide application for clinical use in many patient populations,” she says. McKay’s fNIRS cap fits young children, but her team is raising funds for special sensors better suited to the delicate heads of newborns. See their fundraising page to make a donation.